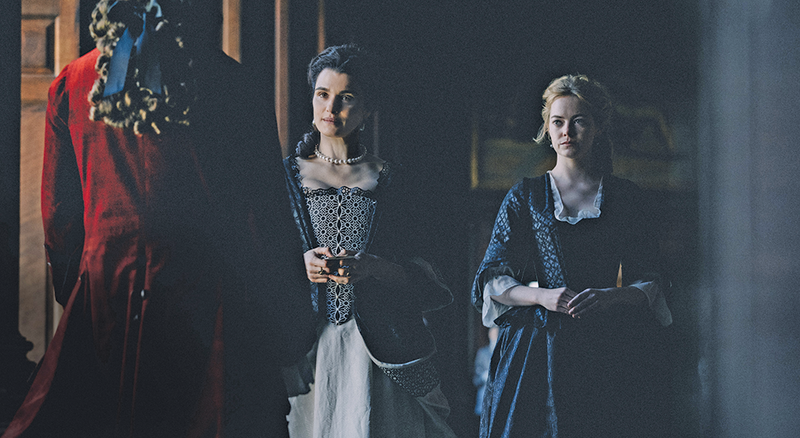 Power collides with gender in the acidic The Favourite. When can it be said that someone truly has power? That's a fraught real-world question in this year of our Lord 2018, as we watch the capricious use of power play out in tweets and news conferences, but it's always a fascinating question for artists to explore. Do the people who seem to have power actually have it, or are the strings being pulled on a more invisible level? And even then, are those invisible string-pullers as powerful as they believe themselves to be? The Favourite—from Greek director Yorgos Lanthimos (Dogtooth, The Killing of a Sacred Deer) and screenwriters Deborah Davis and Tony McNamara—digs into that notion by way of an intriguing footnote from 18th-century English history. Circa 1709-ish—the screenplay conflates the timeline for dramatic expediency—Queen Anne (Olivia Colman) reigns, yet much of the decision-making actually resides with her primary attendant and confidant, Sarah, the Duchess of Marlborough (Rachel Weisz). That dynamic, however, threatens to shift with the arrival of Abigail Hill (Emma Stone), Sarah's cousin, who has been forced to seek employment as a result of her father's financial ruin. Abigail sees an opportunity to insinuate herself into the queen's favor, but Sarah isn't going to surrender her place as Her Majesty's favorite without a fight. The screenplay intertwines this battle of wills with the key political issue of the era, as the noble-representing Tories led by Lord Harley (Nicholas Hoult) attempt to persuade the queen to end England's costly participation in the War of the Spanish Succession, while Sarah—whose husband leads the English army—pushes to continue. But while the specifics of that event might suggest a dizzying array of historical facts and figures, The Favourite is more concerned with the big-picture notion that power plays are taking place everywhere at court. As soon as Abigail arrives, other house servants are putting her in her place with cruel jokes; Harley attempts to turn Abigail into an ally who can whisper his positions into the queen's ear. There's never a moment when The Favourite isn't emphasizing who has the upper hand in any given interaction, and who's trying to get it. It would have been easy for all of this to play out as a sterile exercise in palace intrigue, where the opulent sets and costumes do the heavy lifting to suggest prestige drama. Lanthimos, however, repeatedly undermines the expectations for the way this kind of story will look and sound. Cinematographer Robbie Ryan employs wide-angle and fisheye lenses to turn scenes into distorted funhouse mirrors, or trap characters in miniature against the extravagant backgrounds. And while the score occasionally makes use of the plinking harpsichord you'd expect to hear when seeing men in powdered wigs and powdered faces, there's also the almost metronomic sawing of a single note on strings, creating an ominous pulse that makes The Favourite feel more like the horror movie it kind of is. Three terrific central performances anchor it all—and, despite the category-fraud nonsense of the distributor pushing Stone and Weisz as "supporting actresses," they're practically equal sides of a triangle. Colman gives Queen Anne an almost tragic quality, from the rabbits the childless monarch keeps as reminders of her many miscarriages, to her obliviousness to the matters of state she leaves to Sarah. Weisz's over-confidence in her special relationship with Anne—which becomes even more complicated with one particular revelation—hardens into daggers of dialogue when she sees that relationship threatened, while Stone broadens her range with a wonderfully devious villain role. The undercurrent to all three of The Favourite's main characters' actions is that they are women attempting to wield power at a time when men can barely disguise their contempt that they have to bow to a woman. Lanthimos and the screenwriters keep the threat of sexual violence hovering forever in the background—or sometimes the foreground—while the c-word emerges as the epithet of choice on multiple occasions. Most significantly, uncomfortable gender dynamics emerge even at a moment when Abigail seems to have triumphed and gotten exactly what she wants. In the world of The Favourite, a woman might seem to be rising to a position of strength, but she'll always be reminded that the place she's expected to be is on her knees.